Visually, Gravity is an absolutely astonishing work of cinematic art. Technically astounding with levels of constructed realism never before seen on screen, this film sets new standards in CGI production that only serves to enhance the narrative and never overwhelms the story or the plight of the characters. Director Alfonso Cuaron, whose previous films include the fabulous Children of Men and what many declare to be the only great Harry Potter film – The Prisoner of Azkaban – has crafted a film that is utterly mesmerising in its execution. The sheer audacity of Cuaron in attempting to bring this to the screen is bold enough in itself, executing it with such mastery is an achievement that should cement his legacy as a filmmaker of supreme vision and skill. Such are the quality of Cuaron’s representations of both the overwhelming serenity and inherent perils of working in space, it is very easy to believe that medical engineer Ryan Stone and astronaut Matt Kowalski are literally floating above the earth rendering repairs to the hubble telescope, even though they are played by the very recognisable Sandra Bullock and George Clooney respectively. From the opening 15 or so minutes of seamless uncut footage in which the camera is moving as though floating in zero gravity, the film never falters as a masterpiece of visual aesthetic and technical wizardry. From the outset, we are acutely aware of the magnitude of their isolation within the sheer immensity of space. The story itself is a fairly simple one, beginning with Stone and wisecracking veteran Kowalski in the middle of a repair mission when they are swamped by debris from a demolished communications satellite that destroys their spacecraft and leaves them adrift in space. From this point, the film settles into a typical battle for survival against the odds, only far superior to the more typical action malarkey that Hollywood churns out with monotonous regularity. As the story progresses, the tension mounts and there are a series of genuinely anxious moments in which our unlikely hero seems doomed to certain failure. For most of the film, Bullock is on her own as the inexperienced Stone and she provides a very solid emotional core for the film. Stone is much like the persona Bullock has created for herself – a lack of pretention and a determination to succeed in a male-dominated industry. In fact, it seems that Clooney’s presence as Kowalski is perhaps an effort to quell any studio concerns about having to pitch an action film with a female lead. Bullock is in every scene and it is the strength of her performance that imbues Stone with the right balance of vulnerability and steely determination under the most challenging of circumstances. Whilst talk of an Oscar win is perhaps overstating things, there would be few actresses who could balance the physical and psychological aspects of the character so well whilst maintaining a likeability that ensures the audience is desperate to see her prevail, even when things seem hopeless. As such, there are no surprises with regard to how it all ends with the Mexican-born Cuaron following the Hollywood playbook to produce a conclusion that will satisfy the masses. Putting the scientific inaccuracies and the somewhat predictable story to one side, Gravity is unbearably tense at times which, when combined with the dazzling camerawork, keeps you mesmerised. It is a film so good to look at that any narrative flaws can be easily overlooked and it may well be Cuaron and/or his Director of Photography Emmanual Lubezki who find themselves in the spotlight during awards season. 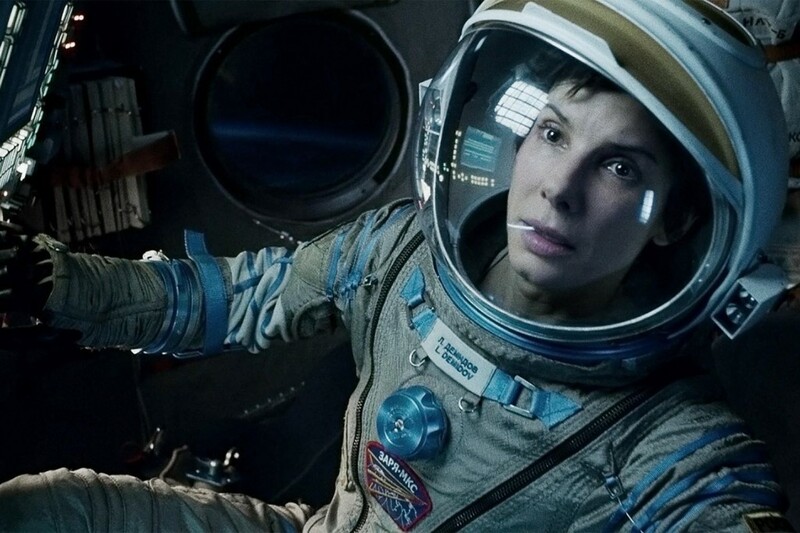 Cuaron has created something very special with Gravity and it needs to be seen on the biggest screen you can find. Having only seen a 2D version of the film, the mind boggles at just how good a 3D-realised version might possibly be. This is a film that oozes beauty whilst surging with adrenaline and is a must-see cinematic experience. Previous Previous post: Whose Interests?